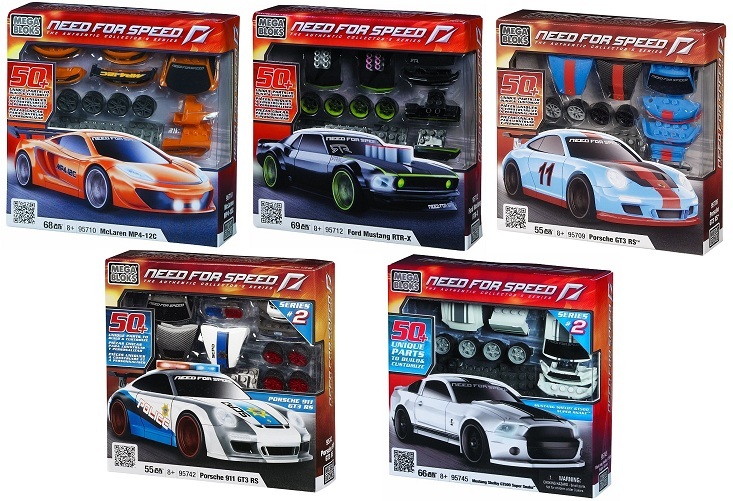 We have bundle together the best selling AND most hard-to-find Mega Bloks Need For Speed cars released to date! Receive all 5 sets & avoid collector pricing when purchased together! Mega Bloks Need For Speed Mustang RTR-X 95712, 69 pieces: Customize your Mustang RTR-X with cool interchangeable parts like silver mags along with glow in the dark mags, a glow in the dark hood highlight paint job and longer exposed velocity stacks to make your ride truly unique! Build, play and display your Ford Mustang RTR-X for the whole racing world to see! Mega Bloks Need For Speed McLaren MP4-12C 95710, 68 pieces: Customize your McLaren MP4-12C with cool interchangeable alternate front and rear spoilers to make your ride truly unique! Build, play and display your McLaren MP4-12C for the whole racing world to see! Mega Bloks Need For Speed SERIES 2! Ford Shelby GT500 Super Snake 95745, 73 pieces: Customize your Ford Shelby GT500 SuperSnake Need for Speed Edition by Mega Bloks with cool interchangeable parts like alternate silver street mags or larger vented hood to make your ride truly unique! Build, play and display your Ford Shelby GT500 SuperSnake Need for Speed Edition for the whole racing world to see! Black and white racing paint job! Mega Bloks Need For Speed SERIES 2! Porsche 911 GT3 RS 95742, 55 pieces: Customize your Porsche 911 GT3 RS by Mega Bloks with cool interchangeable parts like an alternate black hood or swap your emergency lights for an undercover street roof to make your ride truly unique! Build, play and display your Porsche 911 GT3 RS for the whole racing world to see!